The Governor Hill Fish Hatchery was established in 1923, when it was donated to the State by the late Maine Governor John F. Hill. Hatchery buildings were replaced in 1971, and major improvements began in 1998. Two large production wells were drilled and the hatchery room was outfitted with incubation jars for eggs and round "combi" tanks for fry rearing. A facility bulk oxygenation system was installed in 2004 and effluent improvements were completed in 2010. Water for the facility is supplied by natural springs that provide 700 gallons per minute as well as 2 drilled wells that provide an additional 500 gallons per minute. Clean water at constant temperatures allow for accelerated egg development. 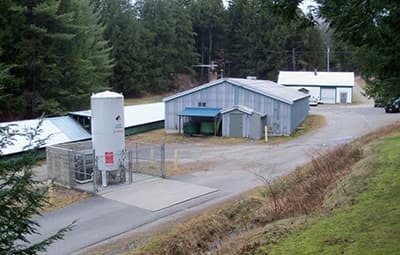 Governor Hills serves as one the Department's primary egg incubation facilities, producing advanced fry that are transferred to other locations for further grow out. This facility is the sole supplier of lake trout and splake (a cross between female lake trout and male brook trout) for the state-wide stocking program, which are grown in 16 covered concrete raceways.